Farrar, Straus and Giroux, 9780374176495, 448pp. Esther Murphy was a brilliant New York intellectual who dazzled friends and strangers with an unstoppable flow of conversation. But she never finished the books she was contracted to write a painful failure and yet a kind of achievement. An icon of haute couture and a fashion editor of British Vogue, Madge Garland held bracing views on dress that drew on her feminism, her ideas about modernity, and her love of women. Existing both vividly and invisibly at the center of cultural life, she like Murphy and de Acosta is now almost completely forgotten. 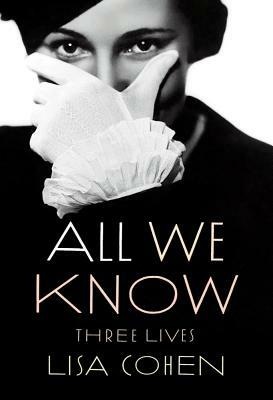 Lisa Cohen's All We Know: Three Lives was a finalist for the National Book Critics Circle award and the PEN/Bograd Weld prize, and a New York Times Notable Book and Editor's Choice for 2012. Her writing has appeared in BOMB, The New York Times, Vogue, The Paris Review, The New Yorker, Women in Clothes, and many other journals and anthologies. She teaches at Wesleyan University.